The average chicken will eat hundreds of pounds of feed in its lifetime. 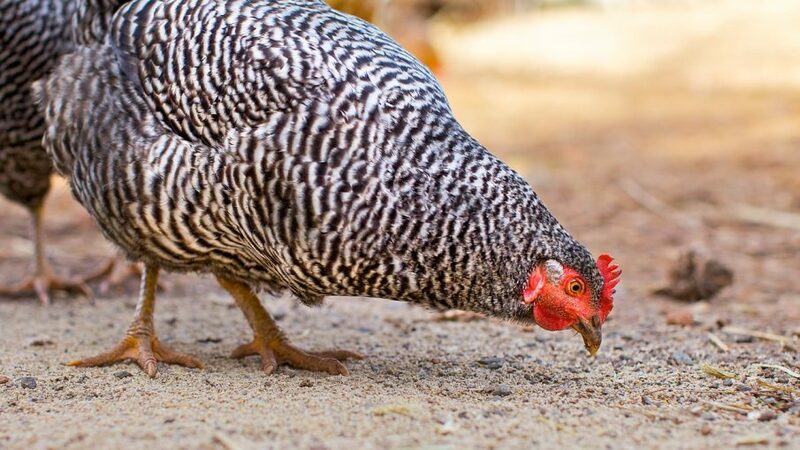 Although many people buy their chicken feed, some hobbyists prefer to have control over what goes into the mixture by making their own chicken feed at home. Formulating your own feed doesn’t just give you control, it can also be cheaper. However, there are many factors in this somewhat complicated procedure. Therefore, it’s critical that you understand the nutritional basics required by your backyard chickens. For the most part, chicks from 28 days of age and up are fed a “starter ration.” This ration contains high levels of protein (approximately 22 percent) to give the chicks the energy they need to grow and develop properly. From eight weeks of age and up to when they start laying (usually around six months of age), the pullets are fed a grower ration containing about 17 percent protein. Once laying commences, layer ration is fed to them. Some of the minerals needed in general chicken feed are zinc, copper, iodine, magnesium, calcium, sodium (0.15%, also equal to 0.37% sodium chloride), phosphorus, potassium, manganese, and iron. Some of the vitamins needed by chickens that must be in their feed are Vitamin E, Vitamin D, Vitamin A, Vitamin K, Thiamine, Niacin, Pyridoxine, Riboflavin, Pantothenic acid, biotin, Vitamin B12, choline and folacin. 6. The number at the upper RIGHT hand corner gives the parts of corn, and in the lower RIGHT hand corner you have the parts of supplement needed to make a mixture with 20 percent protein. Thus, 20 parts of corn mixed with 11 parts of supplement gives 31 parts of feed with 20 percent protein. 7. To convert this to a percentage basis, divide 20 by 31 and multiply the result by 100. The ending result, 64.5 percent, indicated the amount of corn that will be used. The supplement is represented by the remaining percent (35.5). And so…in a 100 pound 20 percent mix, there would be 64.5 pounds of corn and 35.5 pounds of supplement. The above is one of the simpler ways to compute and balance a poultry ration. Commercial feeds will have the required amounts of nutrients and minerals and proteins, but if you’re mixing your own rations, use the Dairyman’s Square to figure out how much you need of each ingredient. OK, just had to comment on this. Do we live in a world where there is “corn” and “supplements”. Was this guide to feeding chickens written by the corn lobby? Am so interested with your activeties.the main thing i need help from you may be if you have 20 kg of fish meats, and and 40 kg of blood which is alredy boiled.how your going to mix the food i need this mixture to be n kg. Hello! Thank you for teaching the Dairyman’s square. I don’t know who John Deck is, but for a practical farmer, yes I have corn and I am thinking soybeans maybe part of the supplement. When you have cotton seed cake, sunflower seed cake, maize bran, born meal and pri-mix, do you have to use this Dairyman’s square formula to come up with required feeds? Thank you for keeping us informed. congratulations. Thank u very much for the dairy man square method.what of having different feed stuffs? Recently I acquired a mixer and I have a registered company. I intend to make commercial feeds for both poultry and cows. Where can I get formulas that I will use for the feeds? Kindly assist. we are seeking formulation ratios for livestock fattening and poultry feeds. using maize bran,soyabean, maize cobs, maize stalks, fish meal,fertilizers urea and DAP. Greetings to all farmers out there! Is the Dairyman’s square similar to the literature ‘Pearson Square’?